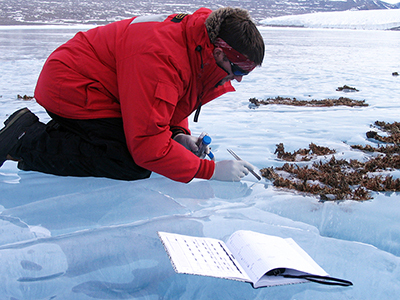 Student samples lake ice in Antarctica. Ecology, Evolution, and Environmental Biology (EEEB) is a multidisciplinary, interdepartmental program of study and research leading to a Ph.D. degree. Students earn a degree in EEEB but closely interact with one or more departments. The program involves several departments and centers, and over 40 participating faculty, and takes advantage of Miami's spirit of collaboration and excellent facilities.